TODAY, MY FRIENDS, I must write about my two oldest friends, and I will begin with my oldest one, my tree! I wish I could hug my tree today, but I cannot. I loved my tree — did I ever tell you that? Or let me put it this way — we loved each other. We had known each other, after all, for forty-six years. Now we’d had some little ups and down, nothing serious. In the shadow of my tree I couldn’t grow any marigolds or petunias, and sometimes I complained, but not often, because I loved my tree’s shadow, too. We were always aware of each other. Certainly in summer. In summer my great oak tree was always there for me, everywhere in the yard I turned, there was my tree. When I read at my dining room table and raised my head to the big windows, there was my tree. My tree had been abused once quite seriously — before we knew each other. My tree grew near the street, under the power lines, and the evil power company had sheared off its head. It had literally removed a whole side of my tree’s crown. Yet my tree had not died; it had grown a new head out of its injured crown. The new head had veered off to one side, however, as it grew, so my tree had a vicious gap in the middle of its crown. Yet as I have said, my tree was a loved tree, and it still had a gorgeous canopy, if a slightly interrupted one. In summer this canopy cooled the whole yard and the front rooms of the house, and in winter we felt my tree stood a lonely guard over house and yard and took on itself the brunt of the ice and snow. Then my tree died. Not a natural death, my friends — no, no. My tree was murdered — didn’t you hear? EARLY ONE MORNING in springtime, a certain company arrived at our house. We had hired this company to install a walkway in our backyard; we had not asked it to repair the slightly tilted sidewalk beside our friend, the tree. But the company made a tragic mistake that day. It thought it had come to repair the raised walk. Too late. The Death Squad had done its heinous work. One huge yellow root of my tree lay exposed among the shards of concrete. Such a round, healthy root! Beautiful! A neighbor came out to look. She loved my tree’s canopy, too, and she said to the killing squad, “You cover that root back up — just cover it right back up!” So the company called its friend, the Urban Forester. He came at once and professed to examine the great elephant toes of my tree’s trunk. “This tree will have to die,” he said. “See the rot down here?” We did not see any rot, and we knew he was colluding with the paving firm. “That tree was old,” the company explained to me the next day. 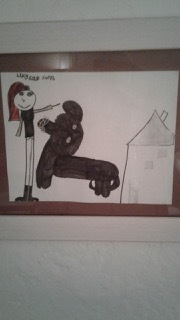 Ellen’s drawing of herself and her Lucy-dog many years ago. I wish I had a later photo of this beautiful pet of ours. I’LL BE ON AND ON about death today, my friends, for I have lost not only my tree, but my dear doggie as well. A month after my tree died, my beautiful black lab of seventeen years was taken from me as well. The gods of family life were jealous, I believe, of my relationships. One night we were visiting with neighbors in our front yards. We didn’t want our dog to be lonely, so we helped her struggle outside. She lay down in the neighbors’ front yard and could not rise. Eventually we were able to help her back to our front door. She lay down in her favorite place on the living room carpet, and that evening I stroked her head and murmured loving words to her. I went to bed, and when I got up in the morning, Lucy was not breathing. I lifted up her head and stroked her old black nose, just to remember what that was like. I made myself cups of tea, and for hours I simply left her that way, so I could look at her and enjoy her company once more. Then I called the vet, and she told me what to do. My husband had flown off on a trip early that morning, but I wrapped the body of my dog in an old sheet, and the daughter of a neighbor helped me move her to the hatch of our van. I drove to the pet hospital, where I could leave my girl’s body for cremation. A young assistant came out to the van to help, and when I pulled back the sheet, she said, ”Oh, what a beautiful dog!” My dog had not lost, you see, the trim, artistic shape she had always had. I felt somehow closer to death that day — to the phenomenon of death — than I ever had before. As just a young girl, Lucy had been a stray. She had hung out on a street where Paige lived, and one day she asked the kids whose dog she was. “Nobody’s dog,” they said, but that people fed her at times and made friends with her. Paige wasn’t looking for a dog, but she she took Lucy in. She looked like a pure black lab, but at the vet’s they said she was part pit-bull! Imagine that. When Paige learned from me of Lucy’s death, Ellen said, she was cleaning out a closet, and she began to cry. When she had moved back to Cincinnati a few years ago, she had not found an apartment where she could keep a dog, and Lucy had stayed at my house. I was Lucy’s grandmother. I AM NOT MOZART, but I wish I could compose a beautiful requiem, a Requiem Aeternam, for these two old friends of mine. May eternal rest be granted them, O Lord, and perpetual light shine upon them. 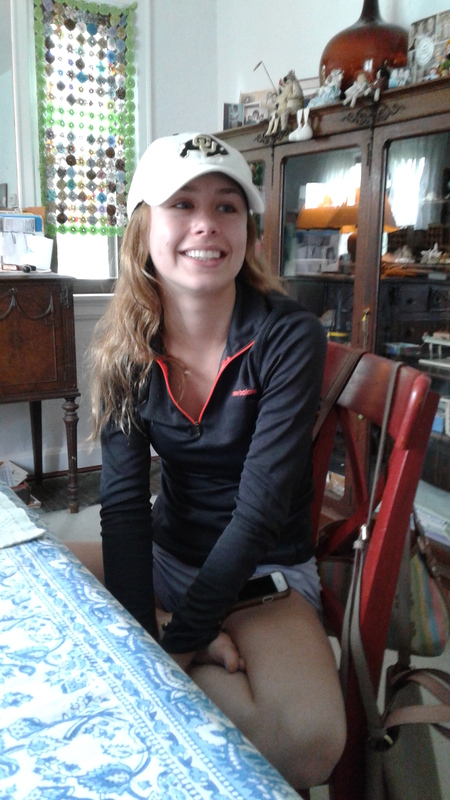 Friends: my granddaughter Ellen left for her first year at college yesterday, and I’m sorry, but I say bad for her! Can’t she realize she’s my best friend and I don’t have any other best friends? Oh well. Her mom, my daughter Paige, helped her pack everything up and get it in the car — bedding and clothes and the whole works. (No room for a grandmom — even in the hatch!) On the way they spent the night at a motel, and that was smart, because today over 7000 new students — freshpersons, if you will (I won’t say freshmen) — will be arriving, as Ellen will, at Ohio State University. Ellen is an addicted hiker and camper, and she hopes to join up with an OSU hiking club, and also find some climate warriors or Save the Earth kinds of guys. She’s reading a book that us older ones may know: Eaarth by Bill McKibben (two a’s because the old one-a’d Earth is gone, says McKibben). And in fact it’s hard, Ellen feels, to find in this tome any hope for Planet Earth. Much has already been lost, McKibben says, everywhere in the world, and he documents those losses most carefully. I didn’t show Ellen yesterday a new poem of mine. It’s called “The Last One.” She’s bound to read it, though, on this blog, so here it is. It’s not a great poem, no-no, but the last verse almost makes me cry. “Spring beauty!” said her mom. “Mom, I’m the last one! The last person on earth. IN MY SADDEST MOODS, I imagine our ruined planet this way: floating over its tragic wastes, as if from spaces beyond, is one magnificent song that has not died: Jesu, Joy of Man’s Desiring. J. S. Bach is smiling over us. Yes, he is smiling as Planet Earth revolves, faithfully, in its ancient orbit, turns, even now, on its old-time axis in just the right rotation for life to have existed here. I expect I will resort to the Earth-net tonight, and listen once more to renderings of this Great Song. FRIENDS, the southwest feels rather like home to me. I seem to be nothing but a deep-dyed southerner, an aged vagabond from Waycross, Georgia. 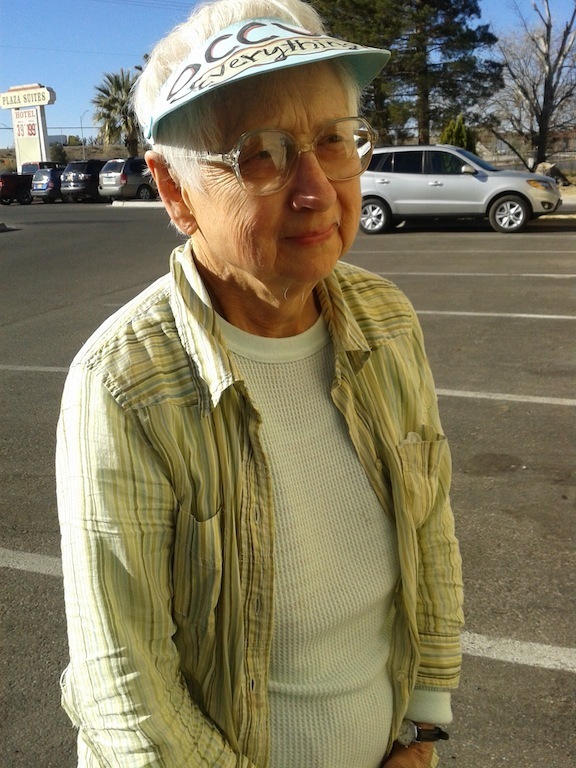 In Las Cruces, though, people seem just as friendly. They talk, they tell you things, and I like that. About sixteen years ago, one of my daughters moved to Las Cruces. I had just retired from U. C., so I went to visit her and my small granddaughter. One visit led to another, and I soon found myself a kitchenette at an old mom-and-pop motel, and began spending the whole winter. Fate, though, wyrd as the Beowulf poet puts it, go-ith however it shall, and my daughter is now remarried and back in Cincinnati. My granddaughter is graduating from Walnut Hills this year. But I have my own karma, after all, my own wyrd, and I still return year after year, for at least a month, to Las Cruces. In this territory, co-ops are common, and I love the co-ops in Las Cruces. I eat lunch almost every day at the deli in my co-op supermarket, looking out its great windows at the Organ Mountains, and I buy all my groceries there. We also have a co-op movie house, the Fountain Theatre, run almost entirely by volunteers, and my friend Aletta and I seldom miss a show there. ON A STREET back of the main post office, there’s a small adobe church, El Calvario, and this winter I helped people there welcome immigrants arriving from the border. The woman minister, Pastor Nema, was happy to have me around, and that night she and several other members friended me on Facebook. I like that. At El Calvario I helped make dinner one night for 24 immigrants just processed at the border — mostly from Honduras and Guatemala. 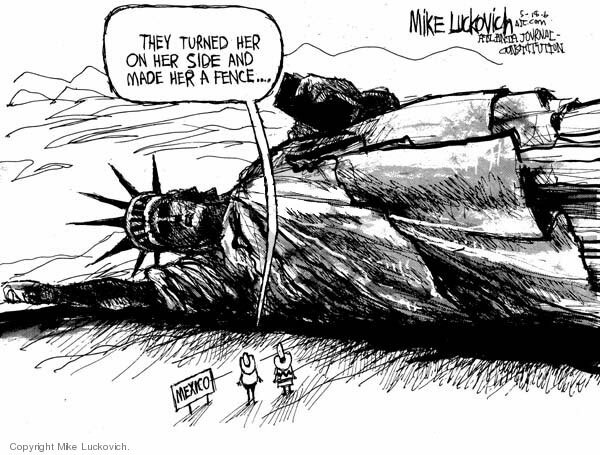 They had been in border detention for up to two weeks while ICE decided what to do with them. The travelers we get carry papers stipulating that their families in the U. S. will provide them a home here. So far ICE lets such people through, or some of them anyway . . . we don’t really know how many are turned back. It feels good, though, to be out front when the ICE bus pulls up with these pilgrims, and to give them hugs and loud hurrahs of beinvenidos. We often we see one parent and one child. So haggard, so tired. We provide them a big dinner with beans and rice, chicken and salad, and a bag of fruit and bread for a late-night snack. Then we put away the tables in the hall and line up the cots they’ll sleep on, with plenty of blankets, for their first night in the this country of ours. Debra, who cooks the whole meal. After dinner, families from other churches also turn up to take some of these fellows home with them, and help them head out the next day for their destinations. Of course wherever they go, they will have court hearings popping up fairly soon, and under the dispensations of our new government, we don’t know how long they’ll be allowed to stay, or what kind of judge they’ll get. As I see it, WE are the ones mostly responsible for the ruined lives these pilgrims have lived at home — under the vicious dictators we’ve supported and the military weapons we provide them. As for El Calvario, I seem to like churches more and more these days — and maybe you do, too, my friends. They’re resisting, after all. Here at Las Cruces First Christian are two women practicing a song for the Sunday service, and guess what it is? We Shall Overcome! I heard my friend Melody intone this hymn-like song that day, with Aletta at the piano, and it was the most beautiful and passionate rendering I’d ever heard! IN CRUCES I SWIM in the mornings at the local pool, an old place that’s cold and not very inviting as to its physical being, but I like talking with the other swimmers in the funny little women’s dressing room. A box-like heat vent extends from a wall. It breathes hard, it rattles and shudders when the heat blows through. The city doesn’t fix this place up, and it also ran out of money when it created its new aqua-center. The promised lap lanes were never constructed. Another dressing-room friend is training for a Triathlon in El Paso next month. She’s a long-time runner, but she also has to swim and bike, and swims every day for forty minutes. At home she has four-year-old twins, puts in her lap time while they’re in day-care. She’s a tall, handsome person, just like the home-schooling mom. 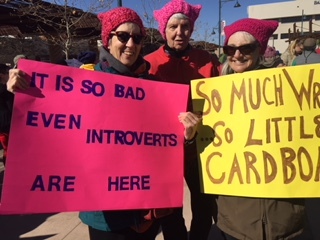 DID I SAY, my friends, that we had a fine Women’s March in Las Cruces? See my favorite signs. It’s So Bad Even the Introverts Are Here. And So Much Wrong, and So Little Cardboard! Las Cruces can be an engaging and interesting place — artists and crafts-people are everywhere, and a kind of counter-culture. On the co-op shelves I find newsletters about herbal medicines, good sleep without drugs, how to be a “nature archivist,” how to measure, not the GNP, but our Gross National Happiness. A medical doctor writes about the rise in gluten-free, and she links this rise to the huge rise in the use of Round-up (glysophate), now the weed-killer of choice for our grain and vegetable fields. What is not interesting is the severe poverty in this area. Democrats are ruling the state legislature. but this month a bill to provide pre-K for all NM kids was hung up in committee and will have to wait till next year! I WANT TO TELL YOU, my friends, about a wild ride I was taken on through the Black Mountains! Hair-pin curves on a narrow winding road way up among the great peaks of the Gila National Forest! Deep caverns down below, and I was scared! A friend from Cincinnati, Chuck Abbott, insisted on this drive as we came home from a day-trip to Silver City — and I should ask your advice as to whether I should ever invite him to visit me again . . . .
See some interesting Comments down below, my friends, and leave a C0mment of your own, perhaps. You don’t have to write much — or cite your email, or even your name. FRIENDS, we all know we’re living in a dangerous time. We don’t know what will happen to us. Will war — one final war, perhaps — put an end to life on Planet Earth? Or will it be fires and floods, storms and droughts, that will write the final pages of our history on this little globe of ours? If we go, will any one out there remember us? Will the universe remember that we struggled, we tried to resist . . . ? That we even made up a little nursery rhyme to help us endure our fears about our leader? Humpty had a great fall. As for walls, and border walls, I have to throw this in. Here’s a fellow creature who knows how to use such a thing as a bossy Wall. “Who’s that scratching my back?” said the Wall. “It’s me,” said a small caterpillar. AS YOU CAN SEE, my friends, I’m a frightened person, and I like to hold close to me at times what is decent and good about Planet Earth: the small ways and byways of our communal life . 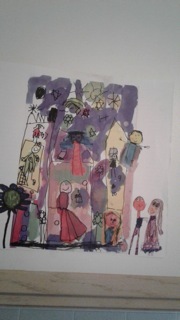 . . and our arts. We’re all creators, I think, in our daily lives, but we have, as well, the formal arts of the past and present to comfort us — the beautifully differentiated music, for instance, of ages and ages past, the designs we once drew on the walls of caves, and our long history of delicate poetry. That’s good advice, I bet. Too late, though, for the five beautiful poems below. I’m not a violent person, and I can’t murder a single one of them! Don’t ask me to do that. I gotta say, too, that I’m not very good at these Wordpress posts — I can’t get things to line up half the time, or the poems to single-space, or the colors to match, or the photos to mesh the way I’d like them to. Can’t always enlarge titles! (Yet I’m grateful to WordPress for the free service it provides! The staff works hard, and all of us users help each other out. See here, in any case, two poems by Walt Whitman, two by William Wordsworth, and a modern verse by a woman, Dilys Laing, who grew up in Wales, and is writing to a grown child during a dangerous time like ours today. Perhaps you can enjoy this little verse by Walt Whitman. Is it trivial, this little spider tale? No, no, you will see that it is not . . . .
Ceaselessly musing, venturing, throwing, seeking the spheres to      connect them. WALT WHITMAN, btw, was an amazing fellow. There will never be anyone like him. He was sometimes not much more than a tramp, but everything in his life, his wanderings, his feelings, the people and places he came upon, were poetry to him. He poeticized his entire life, and heaped it all into a huge, ever-changing mega-poem called Leaves of Grass. 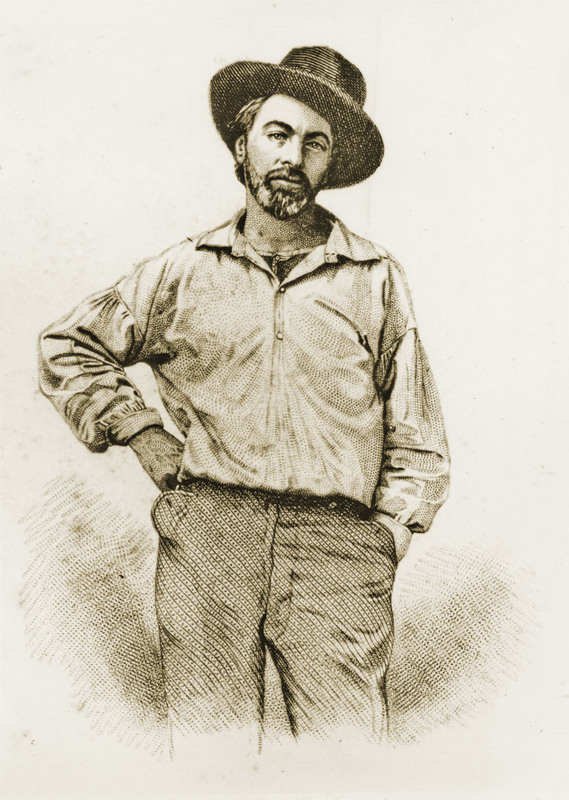 I love Whitman for his work during the Civil War in a hospital in Washington D. C. , giving comfort to the wounded and dying men there, on both sides, writing letters for them — and turning against that war . . . and all wars! Somehow I want to skip forward here to Whitman’s last years and his beautiful requiem for himself — “Good-bye, My Fancy.” You’ll see that a “Fancy” is his term of affection for his writings, his poetry-making powers, his creative genius, if you will. Then if we die we die together (yes, we’ll remain one). 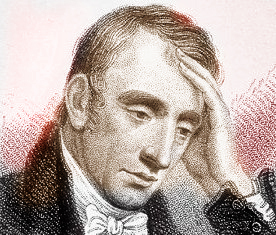 WORDSWORTH, my friends, seemed to write mostly about women, and often about his main companion in life, his sister Dorothy. They loved country life, their rambles and long hikes. Below is a pretty piece about a woman they saw and heard working in a field — singing. Wordsworth, you know, was a naturalist and environmentalist. Remember this verse, my friends? So sad, my friends, that sometimes we want to speak such somber thoughts as those below to a child. In her day, Dilys Laing (1906-1960) was a well-known U. S. poet. She grew up in Wales, married an American. Follow this blog? Leave a Comment — or just say you were here? 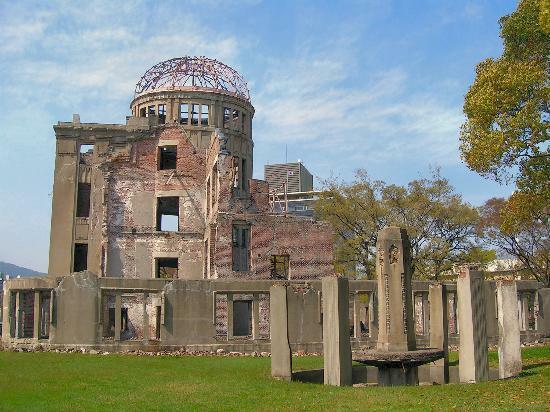 A building that survived the U. S. atomic bomb and was left exactly as it appeared after the blast. It is surrounded now by a Peace Park that is visited by many people from around the world. Friends, I have posted in recent times some of the great poems in our literature on the scourge of war. Among my own poems, the verse you see below is my favorite. I wrote it in commemoration of those who died in Hiroshima and Nagasaki on August 6 and 9th, 1945, and all who may yet perish in atomic war. It imagines what our last day might be like if WE were to find ourselves under atomic attack. And we were in its way. In an illusion of safety. In a bobbing burst down the hedgerow. To see our bit of woods. The lack of sentience in them and all foreboding. It is said that over 60,000 people died instantly in Hiroshima on the day our atomic bomb was dropped — and many more over the years from the radiation sickness that followed. In the central area of the city no life remained; not an insect, nothing, and there ruled a strange and utter silence. The city was entirely destroyed. You may see many pictures of the victims on line, but I will not compel anyone to look at them here. The U. S. remains the only country to have exploded a nuclear bomb. I believe we must work to banish all such weapons if we truly want our little globe to survive. Protests are taking place not just in Japan, but in Los Alamos, New Mexico, where the bombs used in Japan were developed, in California near our laboratories for nuclear research, and in many other places around the world. Three years ago the last crew member of the plane Enola Gay, which unleashed the Hiroshima bomb, died at 93. The bomb he helped detonate was called by our security “Little Boy” (and the Nagasaki bomb “Fat Man”). This crewman had said in his later years that he no longer believed in war or atomic weapons. ON THIS MOTHER’S DAY, we knew, didn’t we, that a lot of mothers are hungry, they’re sick, they’re homeless and on the streets. They have debts and can’t pay them. The rent is due, and they don’t have it. More and more they do drugs. They’re arrested and can’t post bond. Increasingly, they’re being locked up long-term, just like the men, in that famous program of ours called Mass Incarceration. Mother’s Day? — what does it mean to such mothers, my friends? Here I sit just trying to write sensibly about these mothers — and my own privileged position. Like many others, I want to resist the evil empire we live in, with its terrible wars and the poverty it inflicts on its own citizens. I’m not sure I can operate, though, under the brutal dictatorship we’ve put in place. Sometimes I just want to “leave out,” as we used to say in the south, of the whole resistance — just fly away. Yet why should I, Martha Stephens, trouble myself about the Fourth Reich? After all, I have a pension (so far). I can afford to keep up my garden (so far). I enjoyed a fresh salad of my collards and arugula today. I’m not cold, I have heat — so far; and when I’m tired at night, I can sit down rather comfortably on my living room sofa with George my yellow cat by my side, set my little laptop on my lap, and watch music videos on YouTube — so far, that is, while we still have an internet. Last night I watched, along with some strains of Bach and Vivaldi, some interesting versions of “I’ll Fly Away,” plus songs by a fabulous singer named Eartha Kitt. But anyway, is life so bad? Last month my daughters in my town of Cincinnati threw me a rousing 80th birthday party! We sang old solidarity songs, to my sister’s guitar, and heard each other’s raps about the struggles of the day. Then last night, I went to a concert of my granddaughter’s high school percussion group, and it featured an amazing number — my grand-daughter playing a duet with her teacher on two marimbas! 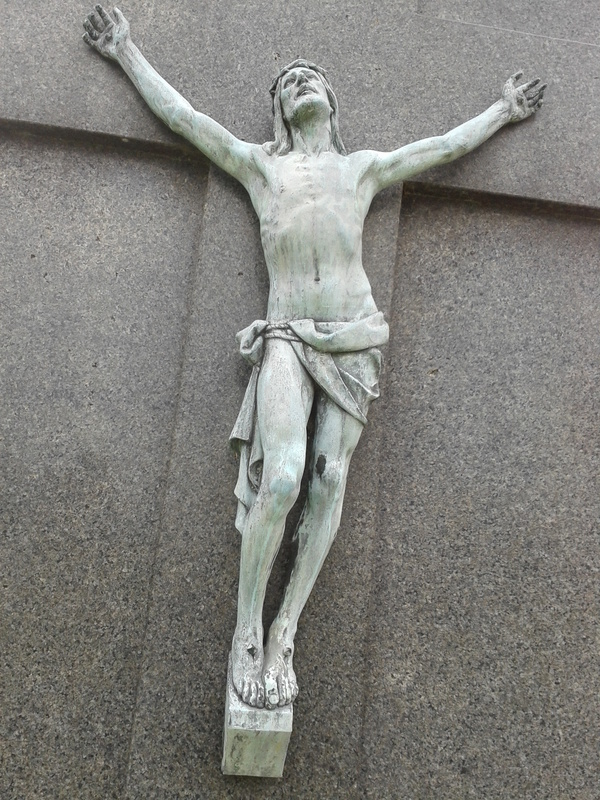 I’ve also spent a weekend on a beautiful campus of Episcopalian nuns, the Transfigurations of Glendale, Ohio. 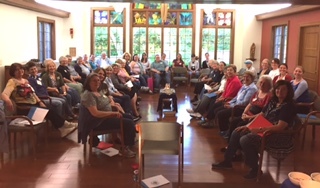 This was the Women’s Retreat of First Unitarian Church, organized rather brilliantly by two of our members. Maybe I just won’t worry about the Fourth Reich. Maybe the worst won’t happen, and in fact, even as I write, a sharp challenge to this presidency is evolving. Maybe the new “Justice” Department won’t be on hand to round up us resisters and hang us! How poor, though, how hungry, will we be — if our new bosses are not thrown out? We were a poor country before November 8, and our two traditional parties did very little to help. (Which is why we got DerTrumpf, it seems to me.) Almost half of the children in Cincinnati are from families below the poverty line. (See the latest U. S. Census if you think I’m exaggerating.) Seventy percent of our high schoolers are on free lunch. So what would happen to the food insecure if the plans we hear about come to pass: food stamps going down, and school lunches taken away from those who can’t pay? Is that where we are in this great rich country of ours? Let’s take a long look at this photo, my friends. 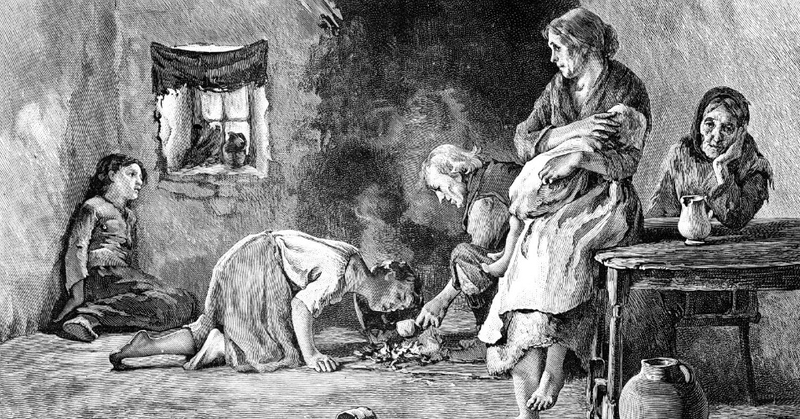 The Great Irish Famine. Is this us in a few years? 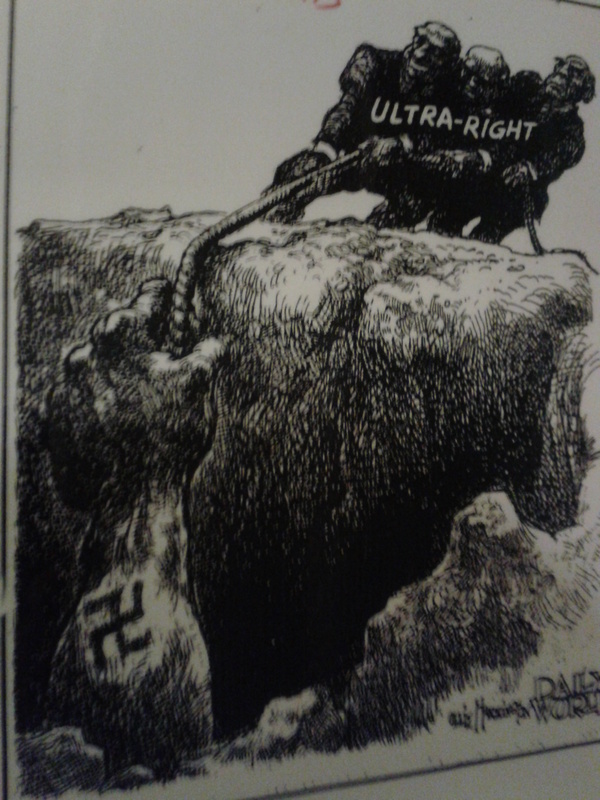 And Here’s Another Question We Must Ask: Will Workers in the Fourth Reich Be Allowed to Organize? Will our last unions be busted and people grow poorer and poorer? 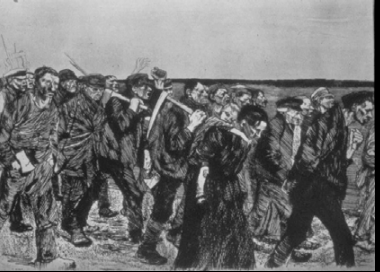 Look here at the Weavers of Germany in this famous art by Kathe Kollwitz. They’re tramping homeward after being fired — just for asking for a living wage. I always think anti-war on Mother’s Day, because Mother’s Day was first created by women who were against war. Julia Ward Howe asked mothers of her time to meet together to work for an end to wars and for “the peaceful settlement of international questions.” A little later a woman who joined in, Anna Jarvis, created the May date for Mother’s Day, and here we are. Both women had lived through the Civil War! Today, women are still leading the way, wouldn’t you say? 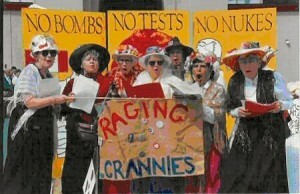 Here’s a photo of the Raging Grannies. They know how to spread the word against those terrible wars of ours . . . that bring death to so many innocent people, and send refugees streaming over Europe and the Middle East. I sang with this group once myself and got myself a bonnet to wear. As of a few days ago, my friends, the Iraq Body Count had registered 194,800 civilian deaths since our invasion of that country in 2003. The Two Women I Love? Well, one of them is the great lithographer Kathe Kollwitz (whose work you’ve seen on this blog before). (See “The Weavers” above.) 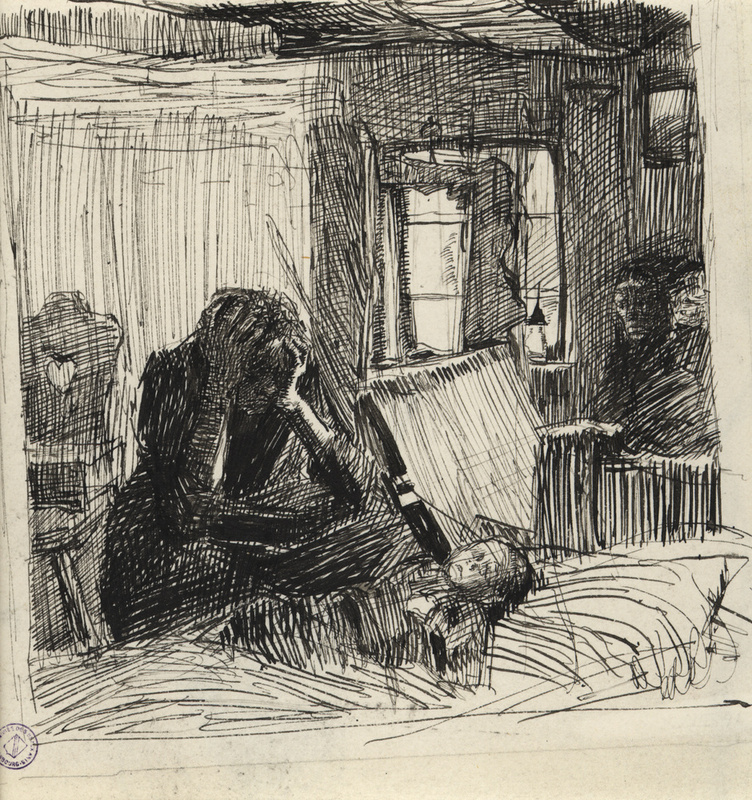 Kollwitz was a deep-died socialist and pacifist. 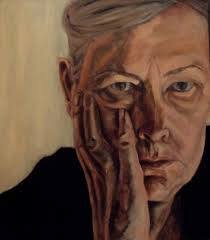 Living in Berlin during WWll, she was removed from her teaching post because of her views and her works thrown out of museums. She and her husband were almost sent to a concentration camp, but her fame as an artist saved them. 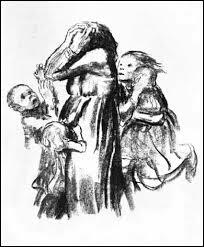 Kollwitz died a few weeks before the end of the war. She had depicted, over and over again, the working people of her time, the very poor, the sick, those struck tragically by war. She had lost a son in WWl and a grandson in WWll. You can see her portrait and read a fine article about her on Wikipedia. Eartha Kitt was also a fine artist, in my view, and known for her stand against war. She was present at a luncheon in the White House with LadyBird Johnson (and said it was boring). When LadyBird asked her women guests why “the youth” were acting up in the streets and smoking marijuana, Kitt told her the truth: they were protesting because they were angry that people like themselves were dying and being maimed in Vietnam. This made LadyBird cry, it was said, got Kitt in bad with LBJ and the CIA, and she was eventually blackballed in the U. S. She said, “Oh well — so what?” and made a new life for herself in Europe, where she was a huge hit for over a decade. As a child Kitt had picked cotton in South Carolina. 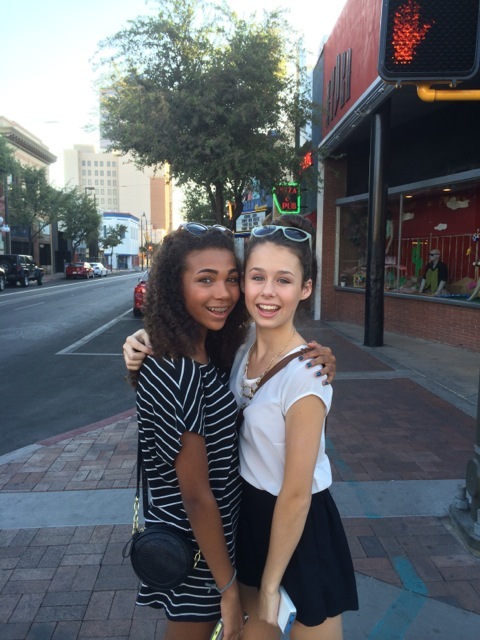 She had no family that cared about her and a white father whose name she never knew. Then a miracle happened. She was put on a train to NYC, by some mystery person of the town, and in NY was enrolled in school. Certain teachers saw her unusual talents and got her into Performing Arts (good for them! 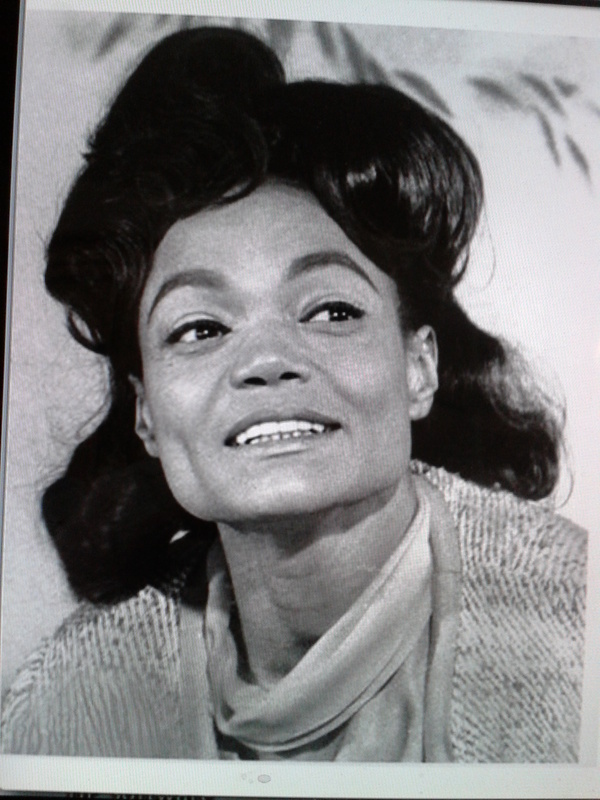 ), and in short, Eartha Kitt was to become a fabulous entertainer. She began as a dancer in an all-black dance troop, but her singing gigs were what really caught on! Get on YouTube and watch her in a song called “Monotonous,” or in “Santa Baby” or “C’est si bon.” She had a tremendous voice, and an amazing, complex, and sometimes dance-like style. Kitt died in 2008 at 81, cared for by her only child, a daughter she had said was her only “family” — but for her proto-family of fans and supporters. If anyone’s still reading –I shouldn’t do this, but I’ll let two male artists into this post with their poems. This one is by the great poet W. H. Auden. It’s a brilliant scene depicting the wars of yesteryear, and yet — is it that far removed from spaces of the earth today? Haven’t they reined their horses, their horses ? No more war, my friends — no more! ARE THESE the end times, my friends? Have we fellows on Planet Earth just been waiting, ever since November 8, for the final chaos to overtake us? I guess we figure, even so, that in the meantime we might as well go on with our lives. 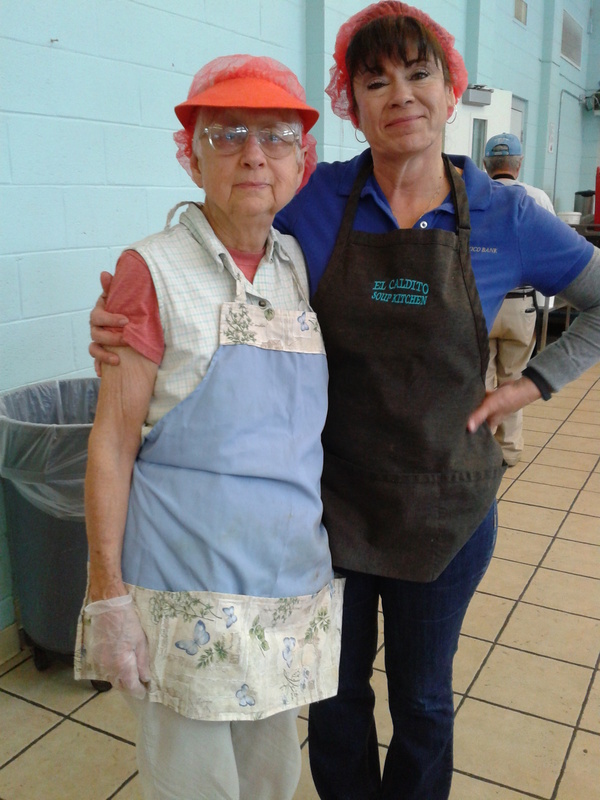 See myself here with my Mexican-American friend Christina at the soup kitchen last month in Las Cruces, New Mexico. We’d chopped vegetables together all morning, and talked and carried on, and now our guests were about to appear — 250 of our fellow citizens, mostly people without work or with work that does not pay them enough to live on. All of them just carrying on, too, I suppose, in this richest of all countries in the world. BUT THESE END TIMES, my friends — is this the twilight of the gods? The last cataclysm, perhaps, as predicted by the ancient writings? Will we see, in the end, the raising of the dead, and the coming, at last, of the true messiahs of peace — and justice — for the earth? In short, must we die now — to be born again? I do apologize for these religious metaphors, my buds, but how else to understand our planetary lives in this moment of — I can’t resist the phrase — gotterdammerung? The Tea Party Is Alive and Well, and Is Every Last Republican with Them? 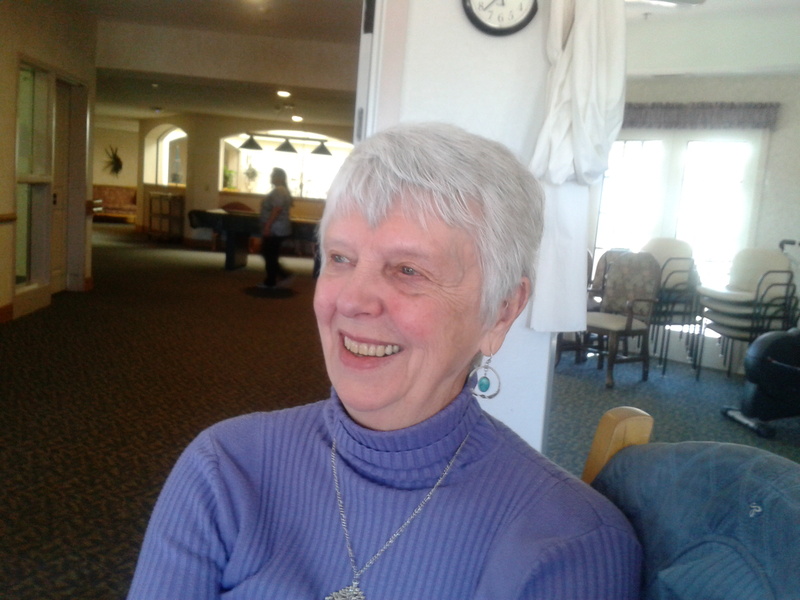 IN ANY CASE, there was I last month, a person of means, one could say, at Plaza Suites in Las Cruces. Still alive, at least, in one of its funny old kitchenettes. I’ve visited at Plaza for fifteen years now, longer stays and shorter stays, and the sights and sounds that surround me there are like old friends I’m allowed to remember from another life. In fact, I’ll tell you this: in my dreams in the other world, I know I’ll still hear the cleaning carts clattering over the tiles of the open-air corridor past my door. Yes, I’ll still hear the carts of the young Latina cleaning women at Plaza Suites. And I’ll hear once more a small voice crying out to me from the narrow strip of kitchen at the back of the front room. “Wipe me!” this little voice will cry, over and over again, and in my dreams I will try to comply. Yes, I’ll wipe and re-wipe the dark ledge of counter around my sink, though this counter can never be wiped clean. After some forty years of nicks and blots and blotches and burns, these counters in all the Plaza kitchenettes are totally — how shall I say — injured? But not fatally? These counters are in twilight now, just like the country and me myself — I’ll be 80 next month, after all; and good old Plaza Suites, as I have known it, at least, may be entering its twilight years as well, for my owner, Joe Wilson, is ill and not sure to recover, he says. Joe, get well. Live on, my man! Some of the immigrants detained in an El Paso detention center have been helped by the Catholic Diocese of SWNewMexico. They created last fall a program where people from the center could leave if they had families to receive them. The small church I attend, First Christian, became part of this program. 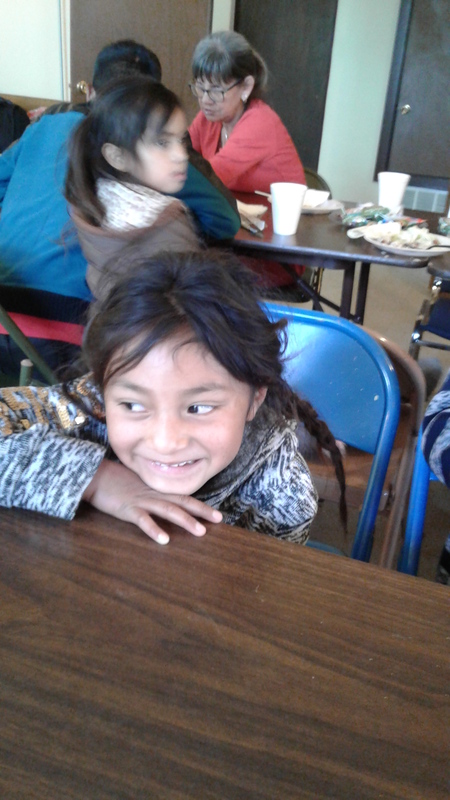 For several months vans pulled up at church homes bringing refugees from Central America. They were to be kept overnight and then sent on to their relatives around the country. My friends the Bruners put up three families from Nicaragua, Guatemala, and Honduras. These “families” consisted, though, of one parent and one child; it seems that when children were involved, the authorities accepted the release of one parent, but only one, to accompany them. Julia Bruner says she liked doing this job, and that even with her small Spanish, it wasn’t difficult. Still, the Bruners had a couple from Guatemala, a father and young son, that seemed a little baffled by things. They were not used to beds, she surmised (only mats on the floor? ), or even to eating utensils. 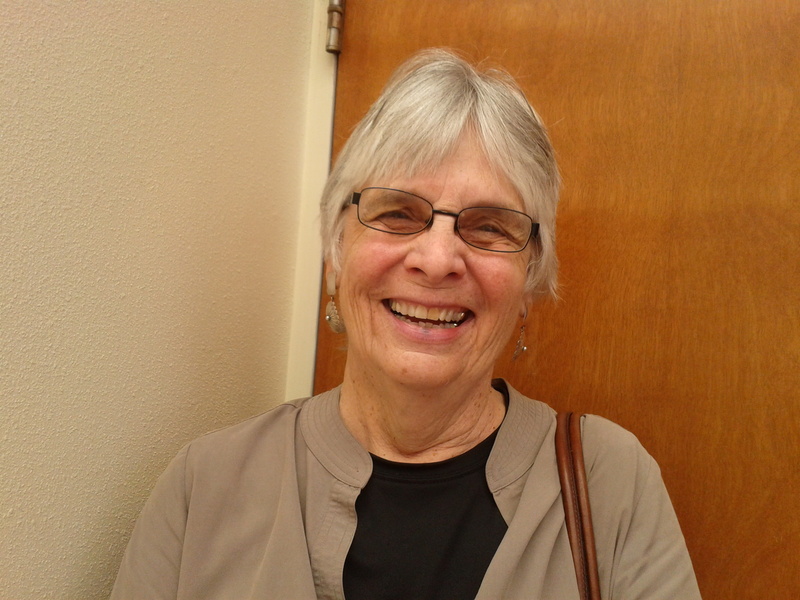 Julia also learned of a refugee woman who had traveled for weeks in the same clothes, and when she was taken to a Catholic thrift store to get some clean ones, the garments she was wearing had to be cut from her body — they had stuck to her skin. Are we the Evil Empire, my friends? The day I was picked up at the El Paso airport by my church friend Aletta Wilson, I learned that the day before, February 3, she had dropped off at the same airport one of her own refugee families, but had then learned that everything had changed and there would be no more such families to assist! One hundred and twenty-two families had been helped, but now — no more! The Unitarians in Cruces are showing, btw, a wonderful film about immigrants called Harvest of Empire! (See it on YouTube.) It describes what the U. S. has done in the countries of Central American to keep popular governments from succeeding there — so yes, my friends, people try to flee from the brutal regimes we have armed and still support. 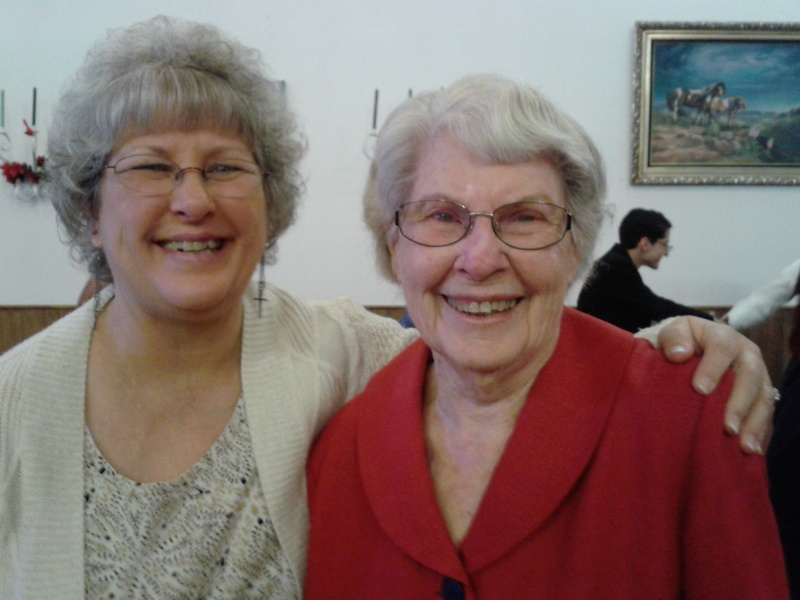 Robin and her mom Elsie are always at church together. 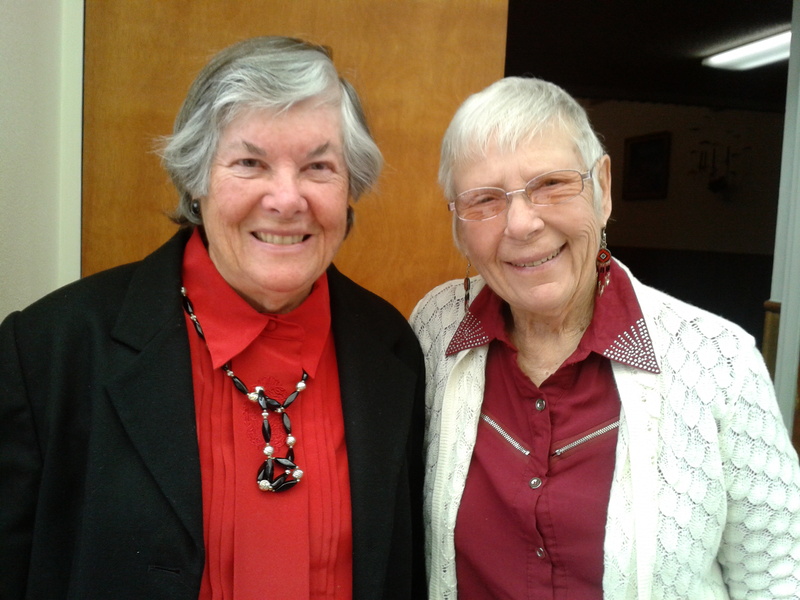 Carol and Joy are church elders. They got married recently! Wanta include a few more church friends. I guess you didn’t know that some of us radicals love our churches, which have sometimes been the last line of resistance to the system of wrong we occupy! 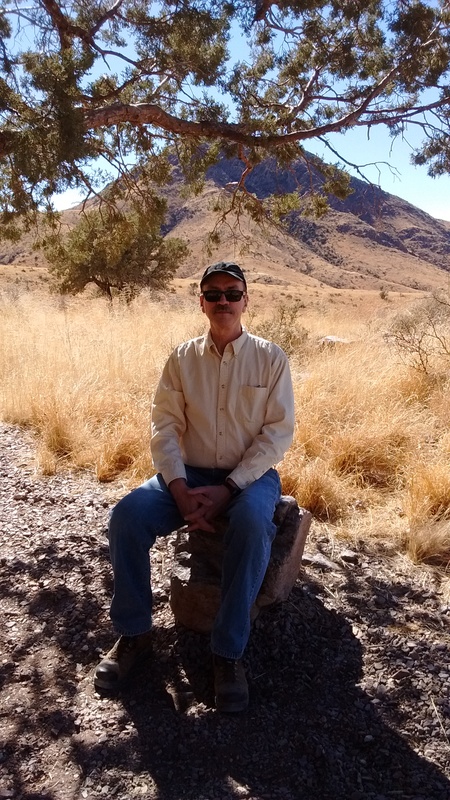 Las Cruces — What Are You Anyway? ON ANOTHER SUBECT — not everything is wonderful here in Cruces, my friends. Urban blight to rival Cincinnati’s. Poverty. Dirty-looking ramshackled housing units everywhere you turn. Homelessness. But many more people are fighting back these days. I went out one day to join a mass protest against Rep. Steve Pearce. He hides now from his constituents just as Senator Portman does in Ohio. I also took in a meeting of the SWNewProgressives — some call them “the new Berniecrats.” They’re working to defend public lands, for instance, from the developers, and to stop the diverting of the area’s last free-flowing river, the Gila. The Progressive Voters Alliance is also in full swing and has to hunt up extra chairs for its overflow crowds. Activist groups turn up at official meetings no one used to know about — at the county commissioners, for instance. Did I say that Clinton won NM on November 8, and that the Democrats took over both houses of the legislature? How ’bout that? I GOTTA SAY that in this town people seem to love their arts. The Arts Council brings to the old Rio Grande movie theater downtown a solid list of good events every week. Local talent mostly, in music, dance, talk, plays! A woman of my own age named Alice Davenport is an old friend of mine in the sewing arts! 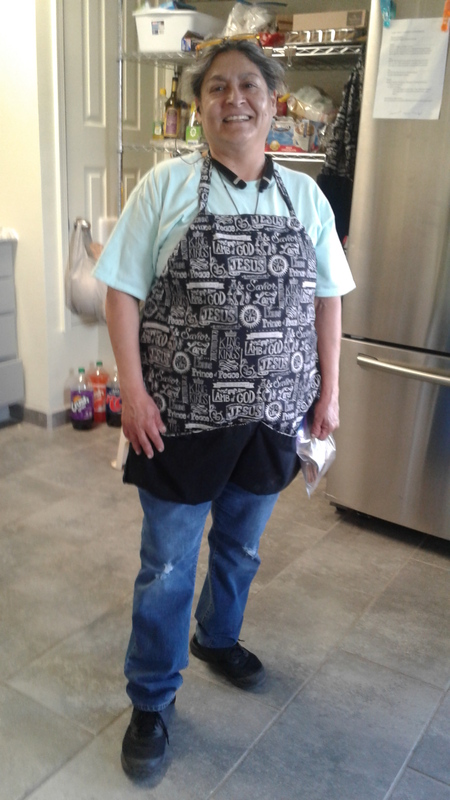 She’s a wonderful seamstress and has made all my skirts for years. (See her Moonbow Shop on line.) 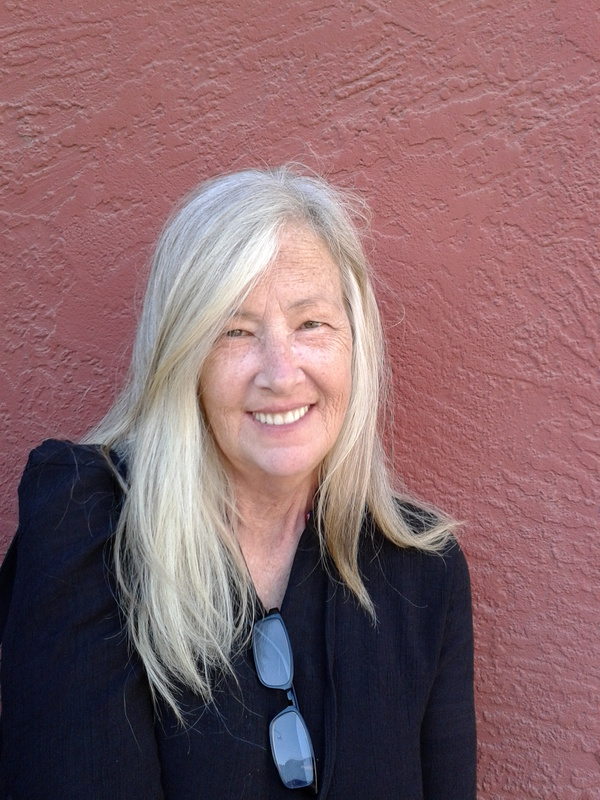 Last month she took me with her to her book club, where a local woman named Shelley Armitage spoke about growing up on a farm in the Texas panhandle — and her book Walking the Llano. It’s a fascinating story! YOU SEE, I’m trying to be positive once in a while. Late at night at Plaza Suites, I get on my little laptop and remember that Cosi fan tutti is still there — so far! — and Orfeo ed Eurydice, and the songs of Mercedes Sosa. INDEED, I’m wishing all of us plenty of friends, music, art, and peaceful times . . . to steady us for the revolutionary fightback we’re waging! NB: If you’ve read this far, my friends, please consider Following this blog. You’d get a notice about new posts only every month or two — and I don’t always write this long! Also happy to have your Comments little or big . . . .
FRIENDS, much of life is frightening to me today. I’m afraid of our newly-elected president. I’m afraid for all those caught in the horror of war and am ashamed of the brutal actions of my own country in the Middle East. In my own state of Ohio, I’m afraid of the violence that is propagated here, and I feel a nightmarish dread of the new executions being scheduled. The image that haunts me more than any other is this: a person who has done no one any harm in many years, and has often been a prison counselor, or a medic, in the weeks before, is given a last meal in his cell, walked down a corridor, strapped to a table, and poisoned to death. WE HUMANS can be killers, yes, but we are also creatures of reason, able to examine our own actions. We can decide to do what makes us feel more intelligent and more human, rather than repeating the naked aggressions of the past. THE U. S. is the only western country where the death penalty still exists. Finland had its last peacetime execution in 1825, for instance, Belgium in 1863, Sweden in 1910, Germany in 1949, the U. K. in 1964. Twenty-three states in the U. S. have also ceased putting people to death: Michigan, on our borders, had its last execution in 1846, West Virginia in 1965. In recent years, four governors of death-penalty states have taken it on themselves to put a stop to this practice. Should we ask Governor Kasich to consider such a legacy for himself? It was in the year of 1963 that a long pause in U. S. executions was brought about by a liberal Supreme Court. Since the Ohio resumption in 1999, fifty-three individuals have been put to death, including twelve under John Kasich. I once made a film on Ohio executions for public access t. v. called Don’t Kill for Me. I don’t have a copy of that film any more, but I remember its pictures of our shadow-filled, night-time vigils for those about to die, and the sad and beautiful song it ended with — from the final aria of the Verdi Requiem. OHIO BECAME A STATE in 1803, and executions were by hanging. In 1897 the instrument of death became the electric chair. Our beat-up old chair was last used in 1963, but it had gotten us through 317 electrocutions, and then earned us a few dollars (perhaps) at a yard sale! What we like now are lethal injections. We feel they are the most humane, you understand, even though guys on our death gurneys have often suffered tormented passings. One fellow was in so much pain a few years ago that he tried to assist the executioners to find the vein they needed to finish him off! They finally gave up on this man, a fellow named Romell Broom, and Governor Kasich said, in effect, “If he’s going to be that difficult, let him live — for now,” and Broom still occupies a cell on death row. Like so many of those awaiting execution, Romell Broom is African-American. (Please see a famous poem below about the lynchings of black men in the south.) White offenders have a much better chance of evading the death penalty! IN 1999 A BESPECTACLED young man named Wilford Berry, not a killer but an accomplice to a murder, volunteered to be the first to die when the Ohio death penalty was re-instated, and many in Cincinnati joined a new crusade against executions. I wanted to visit Berry in prison, but he declined. I then sent him a photo of the youngsters in our family, and I’ll never forget the note I got back from him. “Cute kids!” he wrote — this man about to die. At Berry’s death, I was present at a night-time vigil for him outside the prison in Lucasville, and went to work, eventually, on Don’t Kill for Me. 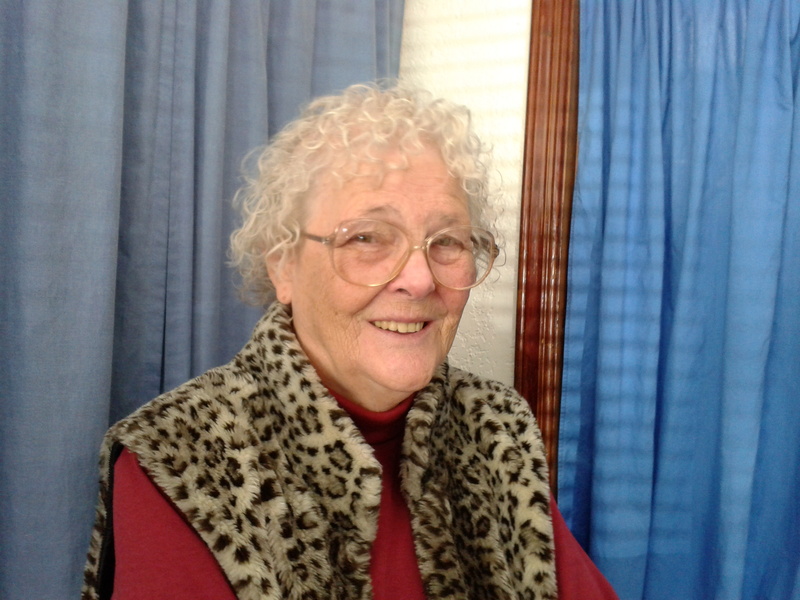 In those years Sister Alice Gerdeman at IJPC took a van of volunteers to every single execution that took place, often leaving long before dawn for a morning death-watch. IN THE FALL of 2015 a Walk to Stop Ohio Executions marched for a week on the shoulders of highway U. S. 23. It was a walk of eighty-six miles — from Lucasville, Ohio, to the seat of government in Columbus! Some of us lasted only a few days, but a group of stalwarts made it the whole way, and hundreds joined the group in Columbus. Over a dozen walkers from Cincinnati took part, sleeping at night on the floors of churches and schools, and speaking out at community events along the way, asking people not to return to the cruel and unnecessary ways of the past. If you wish, btw, to ask Governor Kasich to disavow the Ohio death penalty, please do so at 614-466-3555. Peace to All Who Read These Lines! MY FRIENDS, this little blog has readers from time to time in India, Japan, Canada, Australia, and so on, and I want to say that you fellows around the world must be sorry for us today to be facing a leader like Mr. Trump — who’s stealing Christmas and just about everything else, like the Grinch he is. Trump, as I see it, was a gift to us from our two traditional parties. Democrats no longer much care, any more than our Republicans ever have, about working people, and many voters went over, in desperation, to Trump. We fear they will be miserably sorry, for we’re already a poor country and may now become even poorer. In Cincinnati, a recent U.S. Census has shown that 44.3% of our children are living below the poverty line. The minimum wage here is $8.10 an hour. Affordable housing has almost disappeared. Most schools are segregated and racially oppressed. With so much trouble in their lives, mothers and fathers may not succeed in keeping families together. Black fathers are taken away in droves, and often for years and just for drugs, in the new form of slavery we call “mass incarceration.” In this chaotic economy, men may fight and be killed, or become killers themselves, and be prospects for lethal injections. AS FOR the Trumpster, Black Lives Matter is girding for resistance, it seems, along with our brave Native Americans, our Iraq Vets Against War, and countless other groups. Immigrants are afraid, and churches in Cincinnati are preparing to become sanctuaries for those in danger. The vast U.S. military — will it now be an even greater danger to the world than it has been, or is that even possible? “Killed in Action” by Kathe Kollwitz. The saddest part of all may be the assault Mr. Trump is threatening on our planetary home, and I’m sure all the world is grieving over this. Here’s the famous poem I mention above, one you may know, and speaking of lynchings — what exactly are we doing today — if not more lynchings — in our mass incarcerations? Once more, my friends — Peace to All Who Read These Lines! Readers, you know me as a malcontented person who posts mostly on war and peace; but I hope you will see that this, too, is a tale of war — on helpless vegetables! — M. S.
“Martha! We’re dying!” cried the peppers today. “My darlings . . . yes-s,” I began. I could hardly speak, but I had given life to these friends and knew I must stay the course with them. Sad murmurs along the rows. I steeled myself to go on. I felt they wanted to know everything. “Tonight, my darlings, your limbs will begin to droop rather badly, you’ll wither and go limp, and as the days pass — you’ll become stiff and brown. You’ll be nothing but the withers. No blood, no sap will run in your stems. No voice will you have. No mind to think about your fate. And that is death. That is what we call death, my darlings, my little loves. When I come to your beds again, you will not know that I am here. If I speak, you will not hear . . . . Silence there was for a long time. They were trying to understand the world. Somehow I went on — I don’t know how. “Look at me, my pretty ones! 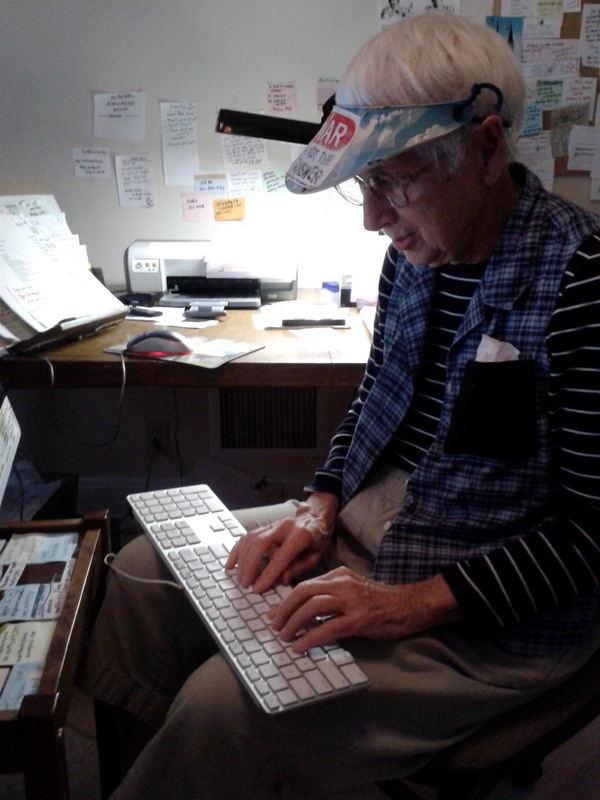 See me — my eighty years upon me? Fix on my face your poor dear eyes. Can you see this face, half-withered even now, as I stand before you? I will tell you today a great truth. On this October day in the year 2016 of the earth, and in the name of the nature that enfolds us all — I will tell you that all creatures go down, as you will tonight, and we big ones go down. We do not know why. Why . . .? we ask ourselves sometimes. But who is there to ask this question of? There is no one — no one. Weak expressions of sorrow trickled out along the rows. On this late fall day, the butterbeans had long since lapsed into the weedy growth of their mounds. In the ferocious summer heat, the cucumbers had hardly lived at all, for the beetles had come; and the summer spinach had been still-born. Only one radish remained from the early spring patch, and Radish was a splendid specimen indeed — a hero of survival, grown as bushy and tall as a pepper almost. When I had observed his peculiar strength, I had not pulled him for his root, his leaves, but left him to shade the Romas, and they had wound themselves about his arms and legs and the peppers nearby, and ripened snugly underneath. Radish seldom spoke. He was a Daikon after all! The friends spoke once more, and I strained to hear, for their tones were fading into the frosty air. From Me and the Grandmas of Baghdad, a memoir by Martha Stephens (in print and ebook).